New York, February 8, 2019: The Arab-American Family Support Center hosted a successful two-day Reclaiming Our Health (ROH) Workshop on February 2nd and 3rd, in support of their Brooklyn-wide Mental Health Initiative launched in June 2018 in partnership with Maimonides Medical Center’s Community Care of Brooklyn (CCB), the NYC Department of Health and Mental Hygiene’s (DOHMH) Mental Health Innovation Lab, and community leaders. Through a variety of dynamic workshops including Mental Health Literacy and Care Management, Community Engagement and Partnership, and Stigma, Discrimination, and Mental Health: Voices of AMEMSA Youth, AAFSC, CCB, DOHMH, and trusted community stakeholders helped attendees learn how to better promote community wellness, access to support and care, and connections to effective interventions within marginalized Arab, Middle Eastern, Muslim, and South Asian (AMEMSA) communities in New York City. The event aimed to empower the AMEMSA community by building on existing resources so that community members can begin to receive appropriate mental health services and supports. Together through the Reclaiming Our Health initiative, trusted community leaders seek to work together with the AAFSC, CCB, and DOHMH to develop education and skill-based training to increase awareness, reduce stigma and offer tangible supports to community members at-risk for depression and other mental health disorders. This will not only expand the mental health safety net in the community, it will also increase the likelihood of people seeking and accessing the support they need in settings where they feel comfortable. The Mental Health Initiative workshop was of the consortium’s larger efforts to reduce mental health stigma and increase access to resources and information through the ROH Program. In addition to direct, trauma-informed clinical services, the initiative utilizes a community participatory model to engage traditional and non-traditional individuals in building a referral network and expanding the conversation about mental health. “The Arab-American Family Support Center is proud to pave the way towards an equitable and compassionate community where no one has to suffer in silence. The launch of our Mental Health Initiative and the success of our two-day workshop are just the beginning of a movement to help marginalized and under-resourced immigrant and refugee communities receive access to the critical mental health services they need” said Rawaa Nancy Albilal, President and CEO of Arab-American Family Support Center. 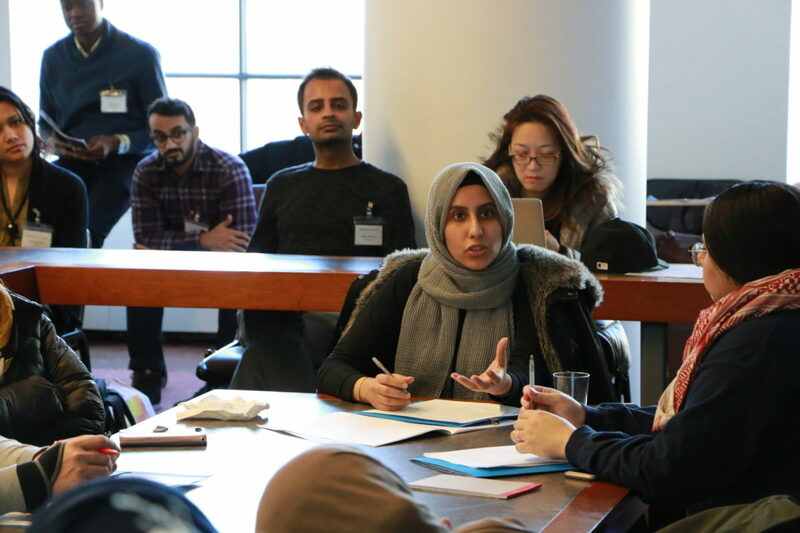 The two-day event, held at the Subotnick Center at the Brooklyn Law School, welcomed 85 attendees and a variety of esteemed providers, educators, and community leaders as speakers and workshop leaders. Attendees received educational and skill-based trainings through breakout sessions with tangible resources shared to address issues the AMEMSA community faces regarding mental health. The Arab-American Family Support Center (AAFSC) is a non-profit, non-sectarian organization created in 1994 to provide culturally and linguistically competent, trauma-informed social services to low-income immigrants and refugees throughout New York City. AAFSC’s mission is to empower new immigrants with the tools they need to successfully acclimate to the world around them and become active participants in their communities. AAFSC initiatives operate across four priority areas–promote, prevent, get ready, and communicate–to promote wellness, prevent gender-based violence and child abuse, prepare family members to lead productive lives, and communicate community needs to partners and policymakers. While services are open to anyone in need, AAFSC has gained expertise in providing culturally and linguistically competent, trauma-informed services to marginalized and under-resourced Arab, Middle Eastern, Muslim, and South Asian immigrant and refugee communities. First established in Brooklyn, AAFSC opened a second center in Queens in 2013 and since 2017 has offered services at Family Justice Centers across all five boroughs. AAFSC is also a founding partner of the Khalil Gibran International Academy, a New York City public high school dedicated to fostering intercultural understanding. Maimonides Medical Center is a non-profit, non-sectarian teaching hospital located in Brooklyn, New York. The largest hospital in Brooklyn, Maimonides has 711 inpatient beds, employs more than 6,000 people, and sponsors a full range of residency training programs and fellowships. Maimonides is a designated trauma center and is Brooklyn’s only designated children’s hospital, and only provider of pediatric trauma services. Maimonides has been ranked by the Centers for Medicare and Medicaid Services (CMS) as among the Top 10 health systems in the country for superior survival rates—placing it among the nation’s best hospitals in achieving better-than-expected results in the care of its patients. The largest Medicaid provider in Brooklyn, Maimonides is the lead and fiduciary for a Performing Provider System (PPS) in the New York State Delivery System Reform Incentive Payment (DSRIP) program. The Maimonides PPS, known as Community Care of Brooklyn (CCB), is a network of over 1,000 organizations, including seven hospitals, ten Federally Qualified Health Centers, more than 4,600 clinical providers, social service agencies, and community-based organizations, who are working together to improve health outcomes for over 600,000 Medicaid beneficiaries. Since the launch of the DSRIP program in 2015, CCB has demonstrated success in engaging with communities, enhancing primary care, improving care transitions, and supporting workforce development, with the goal of achieving the triple aim of better health, better care, and lower cost. With an annual budget of $1.6 billion and more than 6,000 employees throughout the five boroughs, DOHMH is one of the largest public health agencies in the world and one of the nation’s oldest public health agencies, with more than 200 years of leadership in the field. The Division of Mental Hygiene at DOHMH is particularly focused on finding solutions for the complex mental health, substance abuse and associated health challenges of New Yorkers. To this end, the division in conjunction with City Hall and associated city agencies have developed ThriveNYC, a set of 54 programs and initiatives involving an investment of $850 million dollars over a four year period that provides a roadmap for improved care and wellness. The ROH project is being adapted for NYC communities through the Mental Health Innovation Lab. In addition to ROH, the Lab provides consultation, technical assistance and support to enhance implementation and improvement of ThriveNYC initiatives using research- and community-driven approaches.